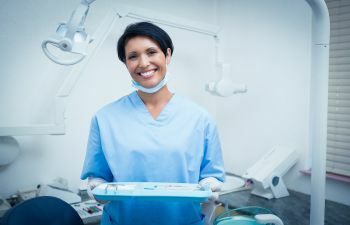 When visiting the dentist, we all wait for stamp of approval at the end of the appointment – cavities or no cavities? While there are certainly more severe dental problems that can occur, a cavity does need attention. Restorative dentistry offers a menu of services that can repair the health and strength of a decayed tooth. In fact, most cavities can be fixed with a simple tooth-colored filling. It is the pursuit of many patients (young and old) to avoid cavities. You probably already know that maintaining diligent oral hygiene and avoiding high-sugared foods and drinks are your best weapon against tooth decay. This is certainly true. However, here is a closer look at what really goes on inside your mouth as a cavity is forming. Decay begins with the presence of bacteria, which can be eliminated each day with proper brushing and flossing habits. If bacteria is not washed away, it will continue to multiply and compromise your oral health. Decay also requires the presence of plaque and tartar build up on the surface of your teeth. Plaque begins to accumulate just minutes after you eat or drink, but this sticky substance is easily removed with your toothbrush. Tartar is hardened plaque, which is effectively removed with a professional dental cleaning. If not treated, the bacteria that feed on plaque and tartar will gradually eat away at the enamel of the tooth. As the bacteria sits on the tooth surface, it emits acids that create a small hole on the tooth called a cavity. The longer a cavity goes undiagnosed, the more extensive the damage can be. If the decay penetrates the tooth center, patients generally feel significant discomfort and a root canal may be needed to restore the tooth. To ensure that a cavity doesn’t ruin your smile, attend your regular dental checkups & cleanings. At Mitzi Morris, DMD, we are dedicated to helping patients maintain healthy teeth and gums for a lifetime. While the presence of cavities is thought of as detrimental news from your dentist, it is very treatable if caught early. At our Roswell practice, we use top quality filling material that blends naturally with your smile.